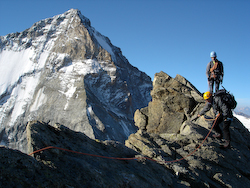 Andy offers a unique guiding experience in the Alps. Nestled between Mont Blanc and the Dolomites is a sensational mountain experience waiting for you. The Alps are a vast chain of mountains. The main climbing and skiing interest runs from the Ecrins National Park in south east France to the Julian Alps in Slovenia. Many famous peaks and villages are found along the range:La Meije, Mont Blanc, Chamonix, the Matterhorn, Zermatt, Grindlewald, the Eiger, Piz Badile, Marmolada, Cortina d’Ampezzo, Tre Cime and Triglav are just a few. We offer a guiding service throughout the Alps, where climbing, skiing and nature offer experiences you will remember forever.